Can you really not go without cleansing, toning and moisturising for a week or two? Holiday skin is best cleaned with a simple facial wipe (better still, a splash of water from the pool or from the sea! ), and you’ll probably find that even if you do want to keep up your usual skincare regime on your travels, those intentions soon go out of the window. 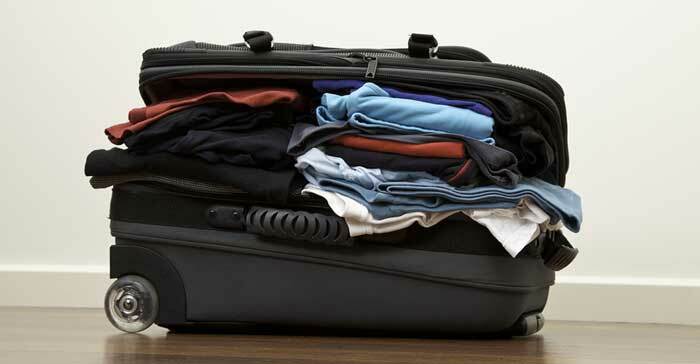 A pack of cleansing wipes is light, compact, and squishes neatly into your suitcase. It’s also great for handling spillages en route. There’s nothing wrong with being clued-up on your destination, but we’d advise leaving full-sized guidebooks at home if at all possible. If you’re equipped with an e-book or tablet, your best bet is to pre-load it with relevant content (be sure to include a good map, local restaurant guide and as many reference guides as you think you’ll need) and leave the paper books and maps behind. If you’re concerned about the data required for obtaining good quality maps electronically, take a look at some of the prepaid mobile data plans that are available for travellers – you might be surprised by the prices. If ironing is on the agenda for you next trip, you might want to consider your priorities – but if there’s a favourite jacket you’re keen to bring that really needs to be pressed, we get your dilemma. Any hotel worth writing home about should at least give you access to an iron, and the majority of holiday homes and apartments will have one in the cupboard. If you’re going to be camping, we’d mostly recommend packing clothing less prone to creases – leave the ironing for when you get home. Now’s the time to get a grip on that negative thinking! It’s highly unlikely that you’ll need a winter coat in most summer holiday situations, and even if you do, it may be better to buy new than risk overweight luggage fees as you attempt to transport your bulky winter warmers. Rain is far more likely to be an issue, and you can get around this problem by packing a lightweight pack-a-mac or emergency poncho. If you absolutely must pack something cosy, opt for lightweight thermal gear (camping shops are great sources of these items) or a fleece jacket instead – layering is the best approach to cool summer days.